House is located in a quiet beautifully manicured, closed loop area with pocket parks and gardens. Begin your vacation fun as soon as you arrive! Home is fully furnished so you can drop your luggage & start enjoying yourself right away. The beds are meticulously made with clean fresh linen, We provide Regular and BEACH Towels, extra linen, pillows, towels, blankets, Laundry soap, a fully equipped kitchen, including those small needed items like sugar, coffee, basic spices, and paper towels, and a LOBSTER POT! PEACEFUL and PRIVATE. Little traffic due to the closed loop neighborhood design, no neighbors in front and enough lawn and foliage around the house makes this a private and quiet location. Plenty of parking and a large garage to store your kayak, bikes, or boogie boards. The patio is a comfortable area to sit, eat, watch the kids play in the yard and enjoy being outside with great views of trees and the many birds that nest in this area. The grill is ready to go and extra tanks are provided. Hiking trails across the street which loop for miles around the perimeter of the neighborhood. Great area for walking and experiencing the shops, restaurants, bars and Museums located in this picturesque and quaint historic village. Rentals are from Saturday to Saturday during June through August. Partial weeks available September through October. location, location, location! Central Cape Location makes easy access to Cape Cod sights. Walk to several beaches in the area! Charming house on private grounds. Close to beaches. Michael's house was very clean, well supplied, and had a very nice patio with great grill. Beds were comfy with ample linen and towels supplied. I would definitely consider this house for another stay in the Dennis area on the Cape. Perfect getaway close to town and beach! The house is cute, clean and well stocked! The location is quite, with quaint patio. About 10 min walk to Dennis market. And I ran or walked to the beach every day, 20 min if you are a brisk walker. But had to drive my teens😊�. Also nice to have sheets, towels, beach chairs etc included. We have been return renters for many years now and love our time at the cottage. Enjoyed the comfortable new sofas and look of the living room. Everything is always spotless. Love the new blue spruce in the corner. The cottage is close to everything we love...the concerts on the green, the Monday painters and the harvest wine bar for nightlife...and can't pass up an ice cream at the scoop. So close to beaches and shops and yet quiet and peaceful. The only wish would a queen in the master bedroom. We have rented this home three summers in a row. 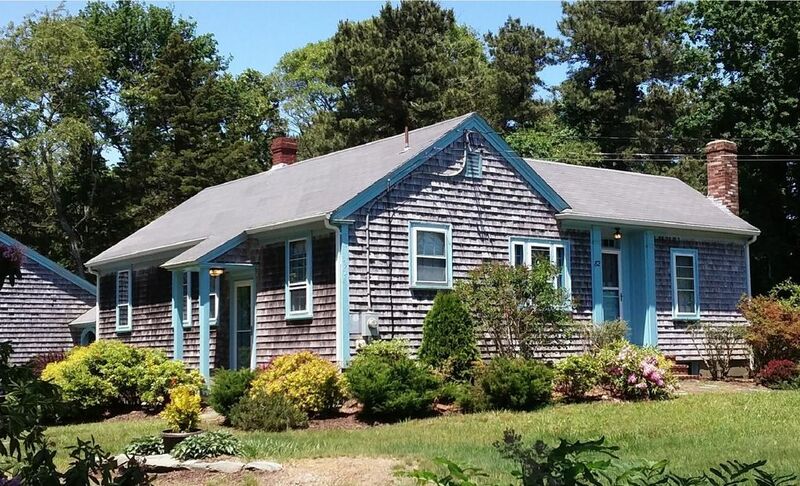 It is a quaint Cape Cod home, and although somewhat dated, it is clean and neat and filled with all the basic non-consumables you would probably need. The washer and dryer and full kitchen and outdoor grill are much appreciated! Also, it is near some of the best Cape Cod beaches, restaurants and shops, and is conveniently located centrally on Cape Cod, making traveling to just about anywhere reasonable. The owner, Michael, has been consistantly helpful and accommodating, and is quick to answer questions via email. We are very pleased with this summer rental! This is a fine little house with large rooms and space to spread out. Kitchen is very well equipped, including washer and dryer. It is clean and neat (only the a couple of living room furniture pieces were well used, the rest was fine, to add to the last review). The yard is just lovely with large blooming shrubs and trees, views of woods back and front. There is a patio area with table and chairs out back, private and pretty. It's in a really nice residential area and close to great beaches, with two markets near by. Loved it there! Hiking /Nature Trails located along perimeter of the house and neighborhood. PROVINCETOWN, the tip of the Cape with galleries, restaurants, nightclubs and specialty shops clustered around lively Commercial Street. NICKERSON STATE PARK incredibly picturesque and a pleasant park to swim, hike, bike, picnic, and just enjoy some of what Cape Cod has to offer.